Is the Labour surge real? The Tories’ lead over Labour has been slashed, from around 18pts to less than 10. The last two polls have put it at 5 and 8 points. Surely the election wouldn’t now have been called if Theresa May had foreseen this. But is the tightening a true reflection of public opinion, or are the polls wrong? Let’s start with the argument that the polls are misleading. My last two posts have pointed towards that – showing that leadership rating is usually a better guide than voting intent to the gap between Labour and the Tories at the election. My analysis was drawn from Matt Singh’s work and he’s now published a more comprehensive study which came to pretty much the same conclusion I did (not surprisingly since mine was based on one aspect of his), that the Tory margin of victory looks likely to be around 15pts. The polls could be wrong because they’re no longer being conducted among a representative sample. The Labour manifesto launch might have motivated the more enthusiastic Corbyn supporters to take part in polls, skewing the sample of those who voted Labour in 2015 towards people who’ll vote Labour again now. Matt’s written a further piece that adds weight to this, suggesting that Labour’s surge in the polls is dependent on people who didn’t vote in 2015 and on younger people. Both are relatively unlikely to vote. This might suggest that the polls are indeed a bad guide to the election result. This isn’t just a matter of sifting through the polls. One part of Matt’s analysis was from local election results, so was independent of opinion polls. And there’s another independent set of evidence to support this: reports of focus groups and doorstep conversations. If Labour really had surged, by around 8pts, and the Tories had dropped off by a couple of points, I would expect people who voted Labour in 2010/2015 – but were recently wavering – to be saying more positive things about Labour and Corbyn than they had been over the last month. But I haven’t seen any sign of this, for example in the Edelman HuffPost focus groups and Lord Ashcroft’s groups. All of this feels like an application of one of the lessons from 2015: don’t just read the horserace numbers from the polls. Pay attention to the other numbers and other evidence. But there was another lesson from 2015 (and the EU referendum) – don’t go with groupthink. So, while many poll analysts are sceptical about the size of the surge and think the true gap must be wider than the latest polls suggest, perhaps the lead really is now just single digits. It feels unlikely to me that public opinion would shift so much on the basis of two manifesto launches – it sounds like it’s relying on a much closer interest in politics among the public than is normally the case. That said, Stephen Bush – who’s usually right – thinks that opinion really has shifted this much as a result of the campaign. It’s possible to imagine the same thing happening now in UK politics. For nearly two years most people haven’t been paying attention and polls have been picking up ill-considered responses. But now, many people are thinking seriously about who they would vote for, and, with Ukip largely off the scene and the Lib Dems floundering, many are remembering that they like Labour. This would mean the current polls really could be right. For what it’s worth I don’t really buy this. It’s not clear to me why this would happen now when it hasn’t in previous elections (the change in the polls now is unusually large). While it’s possible that the shortness of the parliament, the relative newness of both party leaders and Theresa May’s poor performance in the campaign might mean that opinion is particularly volatile, I still find it more plausible that the polls are quite far off and the true gap is currently in the region of 12-14pts. But I’m far from certain. We will have a better idea from watching polls over the next week – when enthusiasm from the Labour manifesto launch, leading to more poll-taking, could wear off (Ian Warren has some pointers about what to look for) – and focus group transcripts, perhaps showing a change in mood. I discussed all this on this week’s Polling Matters with Keiran and Matt Singh. It’s one of our most interesting episodes to date and I think well worth a listen. I recently published analysis that showed leadership ratings are an excellent predictor of election results and used Ipsos MORI’s April poll to project a Tory win of 15-18pts. Their May poll has now been published and, with Corbyn’s ratings having improved and May’s remaining unchanged, that projection has narrowed to 13-16pts. My analysis is based on a relationship that Matt Singh spotted in his celebrated 2015 pre-election article. As with my last article, this post doesn’t go into as much depth as Matt did – if he repeats the analysis he did last time, as he’s suggested he will, his projection will be more thorough than mine. Nevertheless, the comparative leadership ratings in MORI’s last polls have a very strong relationship with the final gap between the parties at the election, so this is a useful guide. With the new data, I’m looking – as before – at both the difference in satisfaction with May and Corbyn, and the difference in net satisfaction, ie also taking into account those who are dissatisfied. Graphs are below, but the headline is: on the gap in satisfaction the Tories are projected to win by 13pts, and on the gap in net satisfaction they’re projected to win by 15pts. With a linear regression (rather than polynomial) this increases to 14pts and 16pts, so the range is 13-16pts (this is Great Britain only, though that doesn’t make much difference to the gap). This means the Tories are on course for a win that’s about as large as the one in 1983 – less than it seemed a few weeks ago, but still historically large. It seems surprising that the projected gap has narrowed by two points when the correlation was very good both for the previous analysis and for this one. I initially thought it might be that views of Corbyn were relatively unsettled compared to past elections as he’d been leader for a fairly short time when the election was called – so the swing towards him might have been unusually large. 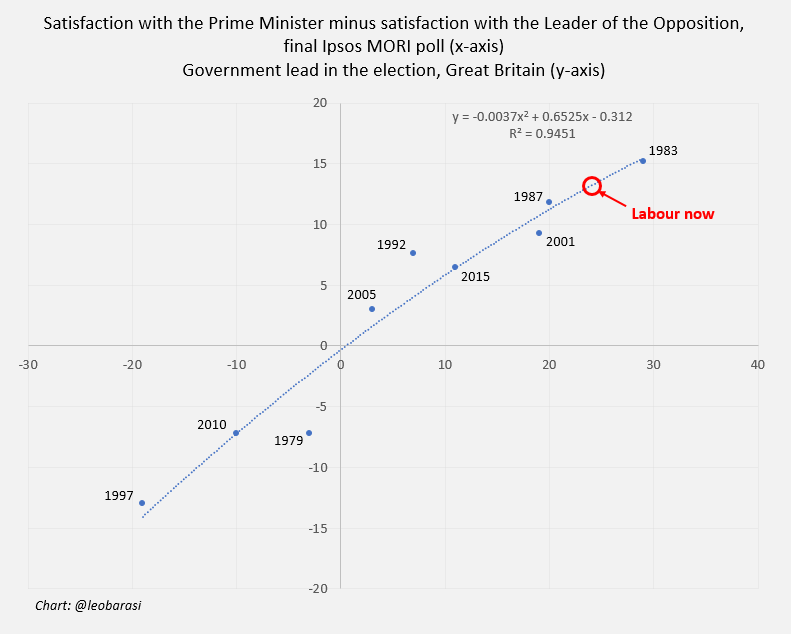 But actually the change in his satisfaction over this period is only around median – he’s gained less in terms of relative satisfaction, since the last poll, than the swing towards Howard in 2005, Blair in 1997 and Kinnock in 1992. The answer may just be that the ‘model’ is quite sensitive and is moved by a change of a few points in satisfaction, but still leaves an overlap around 15-16pts. So, regardless of the reason – and despite Corbyn’s slightly improved satisfaction score – the projection still points to the largest win by any party for at least 34 years. 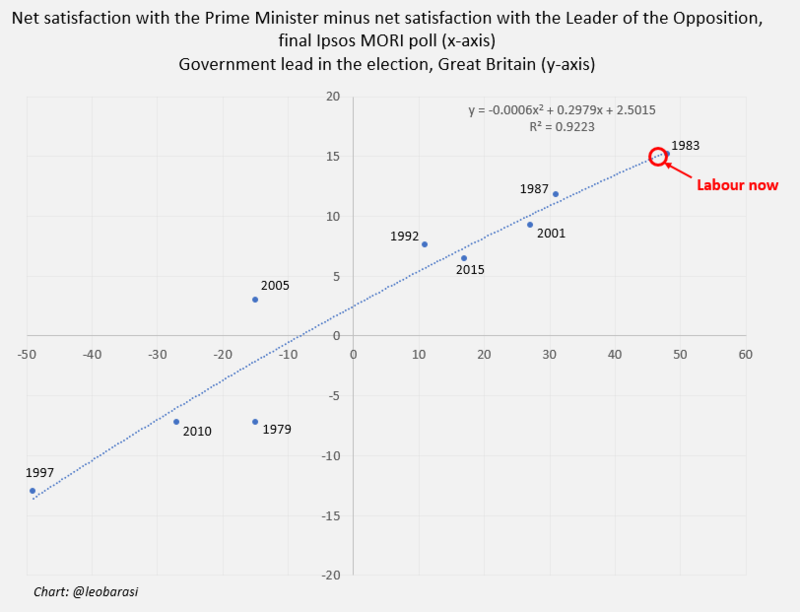 Historical polls show the gap between satisfaction with Labour and Tory leaders, in polls close to elections, is an extremely good predictor of the gap between the parties at the election. It is actually a better predictor of the gap between the parties than voting intention data. The measure suggests the Tories are on course for a 15-18pt win. This means current polls may be overstating the Tories’ lead. Two years ago this week, Matt Singh correctly argued, against the consensus, that the Tories were on course for a clear win. This post recreates one of the analyses Matt used to come to his conclusion. Using it, I suggest the Tories are on course for a 15-18pt victory. I’m using Mori’s long-running data on satisfaction with the party leaders. This was one of several that Matt used and is being widely talked about as an apparent sign that the Tories will win (note, Matt used several other measures as well – my analysis is less thorough than his and I’m not suggesting this is such a serious study as his was). Some high-profile commentators treat this satisfaction data as if it’s a direct substitute for voting intent. So when, for example, 23% say they are satisfied with the job Corbyn was doing, some people have interpreted that as meaning Labour would get 23% of the vote. That is not borne out by the data. 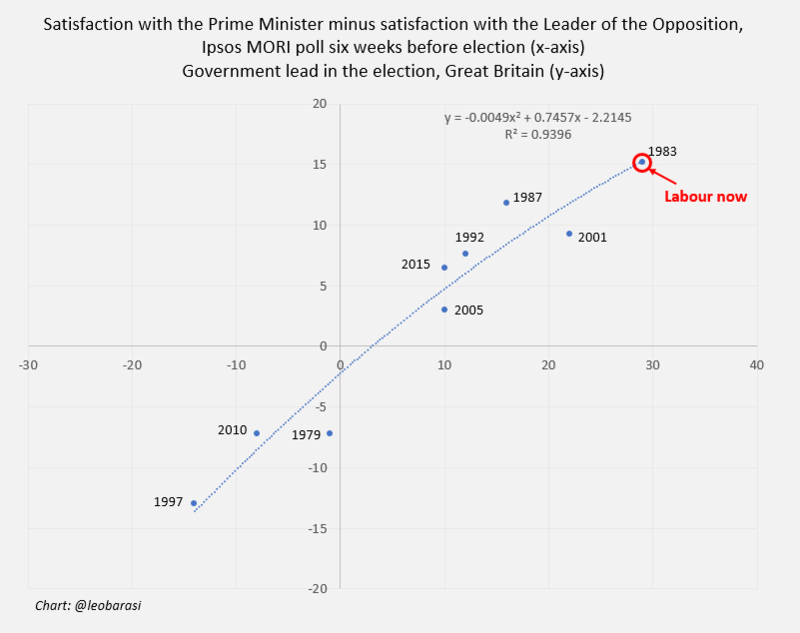 The following charts compare satisfaction with the leaders, from Mori’s polls taken six weeks before the election (chosen so we can compare with the latest Mori poll, from April 2017). 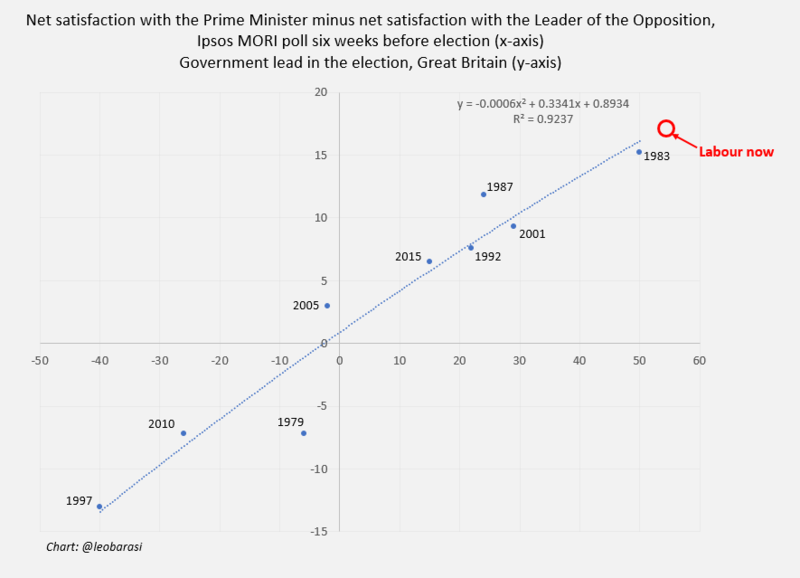 The first shows the percentage satisfied with the Prime Minister minus the percentage satisfied with the Leader of the Opposition, compared with the governing party’s lead at the election. The second is essentially the same, but shows the difference in net satisfaction between the leaders, so also takes into account how many are dissatisfied. For each I’ve used a polynomial regression, as Matt did. This points towards a Tory victory of 15pts if we compare only those who are satisfied. If we compare net satisfaction the Tory victory is 17pts. Both have nearly equally good r-squared values. The fit is almost exactly as good with a linear regression but in that case the Tory victory is around 1pt greater. So I suggest this points to a Tory victory of 15-18 points. This suggests the Tories are likely to exceed their 1983 victory, but probably not 1931. It would mean current polls are mostly overstating the Tories’ lead. The last five have given the Tories a lead of 16-22pts, which appears a little high. That said, it may be that opinion has shifted since the latest Mori poll. Perhaps the unusually short period between elections means opinion is less settled than it normally is before an election, so the 6-week-out poll isn’t as accurate as it normally is. The next Mori poll, out in a couple of weeks, will tell us whether satisfaction with the leaders is indeed still shifting. On a final note: I was wrong. I’ve said a few times that I think the suggestion that analysts should look beyond voting intention numbers, to underlying figures, was like astrology – you could always find something in the underlying numbers to, retrospectively, fit with what actually happened. 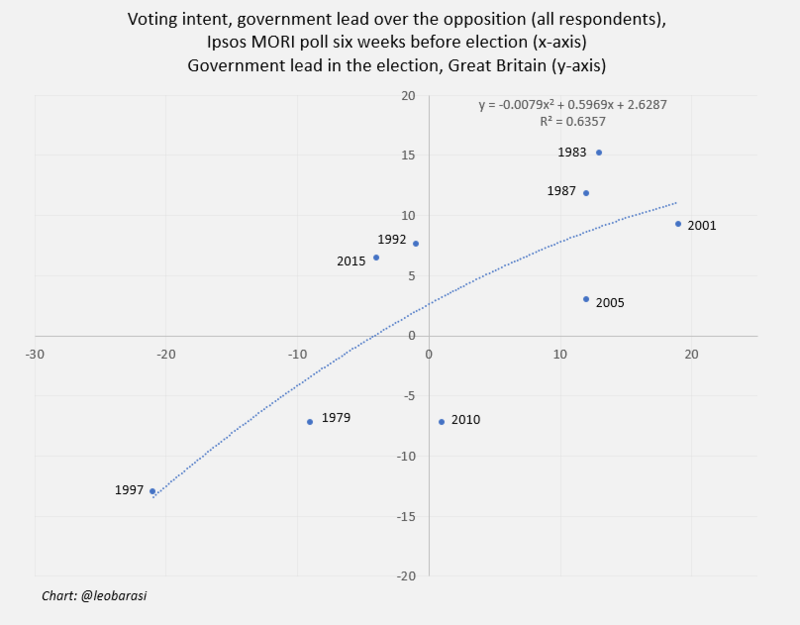 In short, if you want to project the gap between the parties at the election, it’s better to look at the leadership satisfaction – and apply the regression formula – than it is to look at voting intent. Unless perceptions of Corbyn and May shift dramatically, the Tories are heading for the biggest win since before the Second World War. UK worries about climate change are at their joint-highest level for five years according to new data published today. The government’s new poll found that 71% say they’re concerned about climate change – about the same as its poll last year and as high as any poll since 2012. In the US worries about climate recently went reached record levels. It might be that a Trump effect has pushed up concern in the US: his dismissal of climate change may have perversely, drawn attention to the issue. Or perhaps it reflects the accumulation of severe weather events in the US and the success of campaigners there in raising concern about it them. For whatever reason, worries in the UK haven’t seen such a dramatic increase, but have been gradually growing for the last few years. As far as I’m aware, this blog is the first place to have compiled this 12-year data series – which comes from the near-identical question asked in several different sources – to produce this long-running tracker of UK worries about the climate. The latest finding is from the UK government’s opinion survey, the latest wave of which is published today. See below for the data sources and why I’m not totally happy with comparing these results – but overall I think it’s ok to put them together and compare the trend over time. I doubt the small age variation makes much difference. 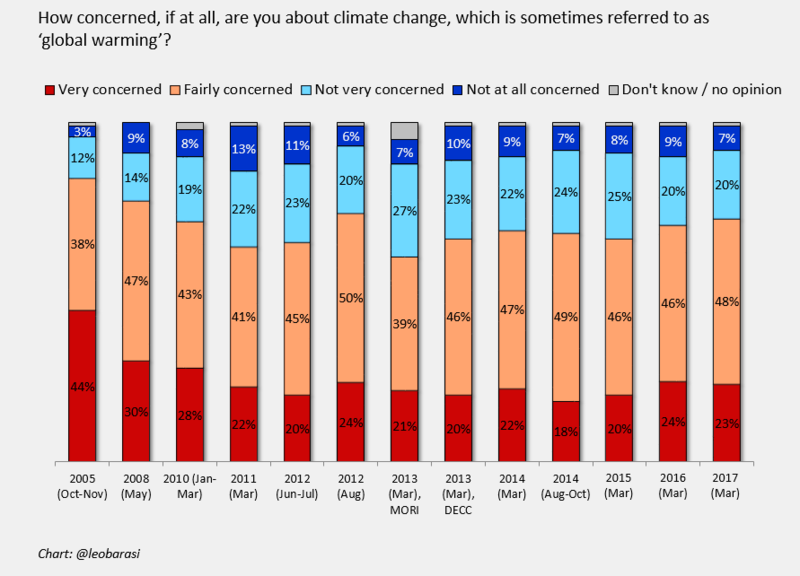 My main concern is I haven’t seen some of the questionnaires/full data tables, so it’s not clear whether there were other questions that might have influenced respondents before they were asked about climate change. The main risk is obviously the 2005 data. Since that’s the outlier in terms of worries, it would be useful to know if anything was done differently in the questionnaire (for example, did it follow other questions about the environment or severe weather events?). All I have is a reference to the 2005 results in a report from 2010. Given it’s so unlike the other results it might be tempting to assume there’s something dubious about it – but as we saw in the US, worries about climate change were higher around 2005 so it does seem possible the data here is right. Given that, I’m inclined to believe the results are ok. The numbers above are correct, the poll was nationally representative and the question wording was the same. But the question was asked as part of a long table with lots of possible threats: acid rain, air pollution etc. I’d expect respondents to tend to answer such questions by partly stating how concerned they are about each item in comparison with others in the list. So the results shown here are potentially skewed by the fact climate change is in this list – though I couldn’t say whether the skew would have been to increase or decrease apparent concern about climate change. As far as I can see other polls in this database ask the climate question in this way. Given this I incline to seeing the 2005 poll as not comparable.